The composition is actually very simple. It is essentially made up of 3 components, i.e. a mango pudding layer as a base with a passion fruit yoghurt pudding layer on top, and a layer of fresh mango puree and diced mangoes sandwiched within the two. The last component acts as an “element of surprise” as the mango puree oozes out as one plunges one’s dessertspoon through the layers. This is an attempt to create the experience I had with Sugino-san’s Tahiti tart, where the “sauce aux fruits de la passion” component too oozed out of the tart as one cuts through it! 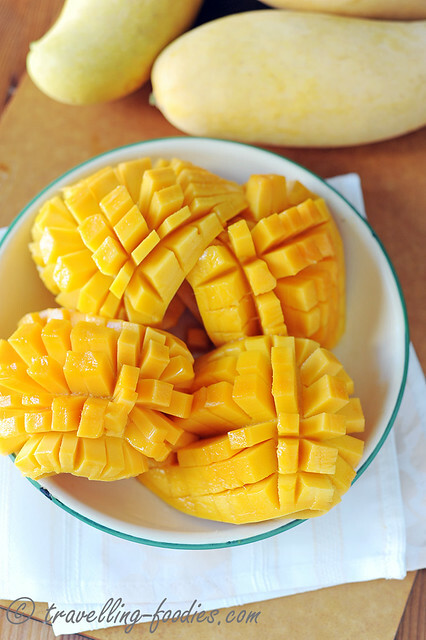 Mango in full galore now as we see many different varieties from different localities hitting the market. I’d used Thai rainbow mangoes this time round as they are a good combination of being mostly sweet with a slight hint of tart flavours. Otherwise, other good tasting and aromatic mangoes would work very well too!! 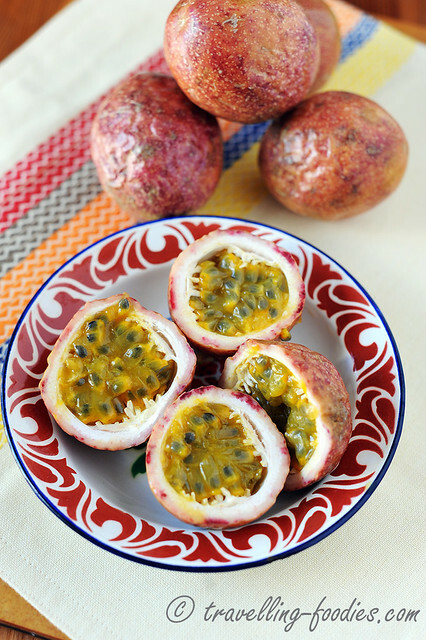 Passionfruit remains one of my favorite fruits to work with because they are so fragrant! And I love the sourish hues of course. Choose those which look slightly wrinkled as they are ripe! Those are sweeter and more aromatic. I’d added greek yoghurt into the passionfruit pudding later to make the sourish flavours more pronounced. This actually helps to accentuate the sweetness of the mango pudding layer below, for good palate contrast! I’d used gelatine sheets as they are easier to weigh out since those from the local baking supply store has them at 2 g for each sheet. They need to be reconstituted in icy water first. Powdered gelatine may also be used of course but the working order is slightly different. Instead of reconstituting in water, the gelatine powder is added directly into and steeped in warm milk at around 40-50°C for about 10 min before continuing with the recipe. Otherwise, the rest of the procedure is pretty much the same. Do take note to squeeze out as much water as possible from the reconstituted gelatine sheets before adding into the milk mixture. Otherwise, the accidental introduction of additional gelatine soaking water alters the liquid ratio of the recipe which may result in the pudding having difficulty setting properly. 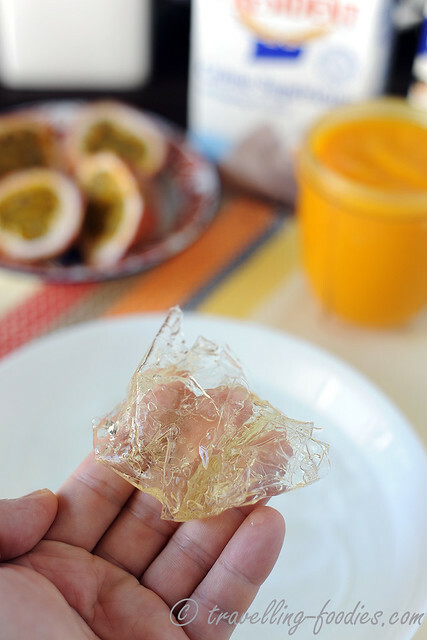 Reconstitute gelatine sheets in icy water for 15 min. Read above if powdered gelatine is used. In a saucepot, add fresh milk, full cream and sugar. Heat the mixture and stir thoroughly to dissolve the sugar. When it reaches around 75°C, turn off the heat and add reconstituted gelatine. If you don’t have a kitchen thermometer, this is when you see tiny bubbles forming around the perimeter of the pot. Add mango puree and stir thoroughly. 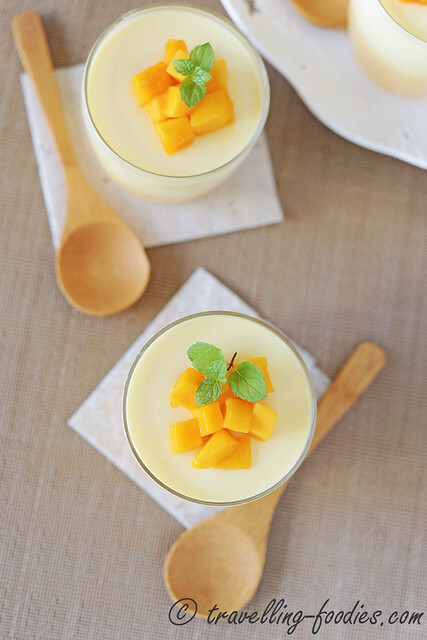 Divide the mango pudding mixture into 6 cups. 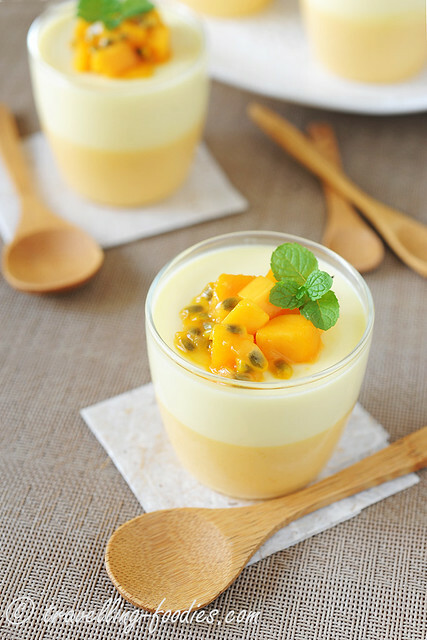 Instructions for preparing passionfruit yoghurt pudding is same as mango pudding with the yoghurt added together with the milk and cream into the saucepot. Take the pot off the stove and leave the pudding mixture to cool down slightly. Check the cups to make sure that the mango pudding layer has firmed up. Divide the passionfruit yoghurt pudding mixture equally amongst the 6 cups. 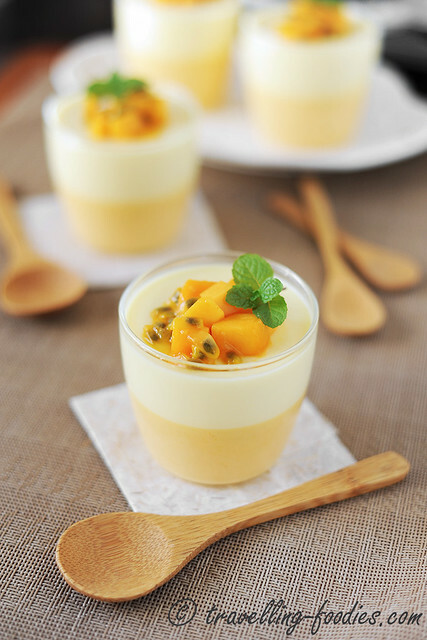 Carefully add mango puree into the the middle of the passionfruit pudding layer, followed by some chopped mango cubes. These should sink to the bottom and become sandwiched between the two pudding layers. Return the cups into the refrigerator to chill for at least 4 hours, preferrably overnight. Before serving, garnish with fresh chopped mango cubes, passionfruit pulp and mint leaves. NOTE: It is best to take the pudding cups out of the fridge 10 min before serving to allow the layers to soften slightly. This entry was posted on June 20, 2014 by Alan (travellingfoodies). It was filed under Food, Simple Eats and was tagged with creme fraiche, 芒果百香果优格布丁, fruit de la passion, full cream, gelatine, mango, Mango and Passionfruit Yoghurt Pudding, mangue, mint, passionfruit, yoghurt. oh yeah! especially stone fruits like cherries and peaches! those are my favs too! This looks so good as usual. I always enjoy your recipes. Is this a pudding or more on the line of a panna cotta in thickness. Here in N. America a pudding is gloppy, where as a panna cotta is more solid. Also am so glad that you use gelatine sheets. I have a problem converting them when the gelatin powder is used. Do you know how many sheets to use on a ratio to a pkg. of gelatin?